Back in Round Four the Panthers went up against the Bulldogs at My Money House Oval and made it four wins in a row to start the season, taking down a tough Centrals outfit by 31 points and returning the Mayor's Cup to Noarlunga. Playing the Bulldogs in Elizabeth has been tough going in the past, with wins hard to come by for the Panthers. However, the visitors took control of the contest early and goals to Sam Overall, Nick Liddle and a pair from Brett Eddy saw South take a 16 point lead into the first break. South Adelaide's tall forwards have caused headaches for opponents all season and that was again the case for Centrals. Overall starred up forward, kicking four goals and recording seven marks, while Eddy slotted three majors of his own. South won the game due to their ability to win possession at the stoppages, ending the game +6 in clearance differential and +48 in the disposal count. Although the major difference came in front of goal, where the Panthers accuracy could not be matched by the Bulldogs. 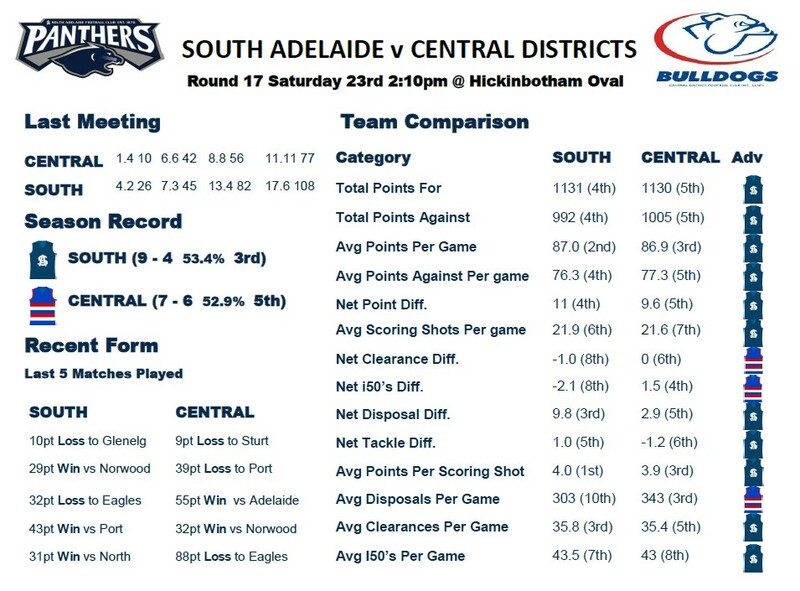 South kicked 4.7 points per scoring attempt compared to Centrals 3.5 points per shot at goal. South have been very consistent up forward this season, proven not only by their winning record, but also by the fact that they are currently leading all other clubs in terms of accuracy for the season. The Panthers slick ball movement and running ability was punctuated by this amazing coast-to-coast goal which started in our defensive goal square - see the goal and Emmanuel Irra's incredible celebration below. Coming into Round 17, South could be boosted by the inclusion of several players off the injury list. Most notably, Cameron Hitchcock has been listed as available after being given an extra week over the bye to recover from a hamstring injury he suffered against North Adelaide in Round 10. Meanwhile, Nathan Daniel (concussion) and Ben Darrou (groin) have been listed as tests, while Ben Haren, Alex Cailotto and Cameron de Visser have all put their hands up for selection as they returned from injury through the Reserves in recent weeks. The Bulldogs enter the round with no major injury concerns, with regular first team selection David Haydon possible to return from an illness. Round 17 is an important week for the Panthers. We come up against fifth placed Central District, where a win may help us secure our finals position for September - as discussed here. 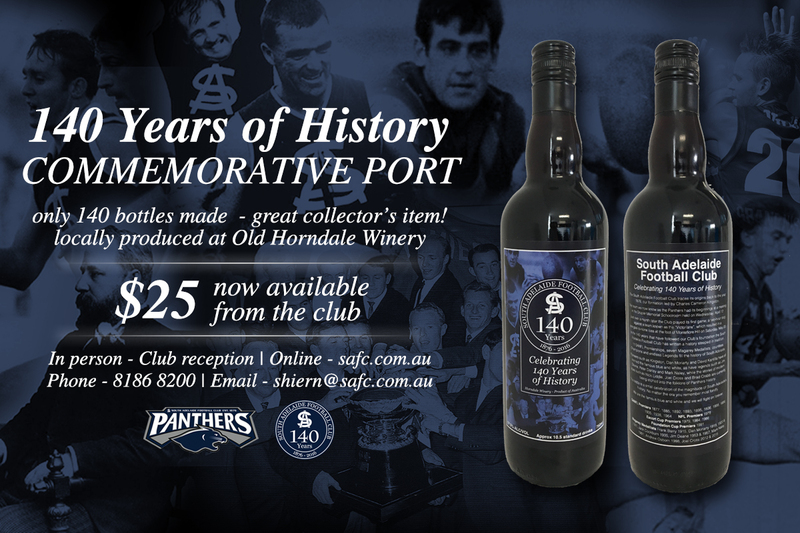 Along with this we are also celebrating Matt Rose's 50th game as a Panther and 100th total SANFL game. If that isn't a good enough reason to get down to Hickinbotham Oval we also have our Panthers Lunch supporting the Prostate Cancer Foundation of Australia and the Panther Club before the game. Meanwhile, our Junior Members will be delighted by the recent invasion of Pokémon at Hickinbotham Oval! South have had a week to rest after their 10-point loss to Glenelg in Round 15, whilst the Bulldogs are coming off a nine-point loss to Sturt last week and a 39-point loss to Port the week before. The Panthers also return to Hickinbotham Oval this weekend, where they remain undefeated in 2016, after a month on the road, which makes it a great opportunity for them to hold third position on the ladder. The statistical team comparison for the 2016 IGA SANFL Season (below) shows that South and Centrals are very closely ranked in most categories. The Panthers and Bulldogs are respectively fourth and fifth in Total Points For, Total Points Against, Average Points Against and Net Point Differential. Across the board South seems to have slight advantages although major ones go to Centrals in the areas of average disposals per game where they average 40 more than the Panthers and net inside 50 differential compared to opponents. Centrals will be keen to end their two-game losing streak and are further motivated by an opportunity to solidify their spot in the five, with a resurgent Port Adelaide looming large behind them in sixth. If the Panthers want to record another home win and maintain their unbeaten streak in Noarlunga they are going to have to continue to make the most of their opportunities up forward and hold the Bulldogs at bay in the possession count. Make sure you get out to Hickinbotham Oval this week and support the boys. Remember; it isn't home ground advantage unless you're there! Looking further ahead, in Round 18 we come up against West Adelaide at City Mazda Stadium before coming back home for Round 19 on Saturday the 7th August for another tough matchup against first placed Sturt.